Both Hackberry Emperor and Tawny Emperor have ranges largely to the south of Massachusetts. Their ongoing presence in this state –in the southern Connecticut and Housatonic River valleys--- has been known only since 1975. They may have been expanding in range and numbers as a result of climate warming. Widespread planting of their host tree, Hackberry, has facilitated their movement. Back in 1899, Scudder wrote that Hackberry Emperor “is a common butterfly of the southern half of the United States east of the Great Plains,” but he listed it in his Vol. III, in the section entitled “Butterflies….Not Found in New England” (1899: 1790). There is some uncertain evidence it might have been here, since the Carnegie Museum has two male specimens, dated 1894, taken by S. W. Denton and possibly from Massachusetts (cited by R. Pease in MAS Atlas), but Holland (1905: 189) lists Hackberry Emperor’s range as north only to southern Pennsylvania, and Farquhar (1934) does not list this species for New England. By the 1950’s, though, Klots (1951: 119, 120) reports the range of both Hackberry and Tawny Emperors as including “southern New England.” This apparently meant Connecticut: there are numerous specimens of A. celtis in the Yale Peabody Museum from 1939 in Greenwich (e.g. 17 August 1939, D. Starrett), and from 1949 in New Haven (e.g. C. L. Remington 18 June 1949 West Rock Park) along the southern coast. But there are no specimens or reports from Rhode Island or Massachusetts until 1975. In that year Patrick Carey wrote in his 1975 Field Season Summary for the Lepidopterists’ Society that “On August 23, while jogging through Forest Park in Springfield, Roger Pease spotted a Hackberry butterfly and collected it with his hands. After Dr. Pease told me about this locality I was able to add another new species to my collection (LepSocSeasSum, 1975).” This discovery by Roger Pease was apparently the first documented report of Asterocampa celtis in Massachusetts. The stand of hackberry trees in Forest Park remains the main state stronghold for Hackberry Emperor almost forty years later (2012). 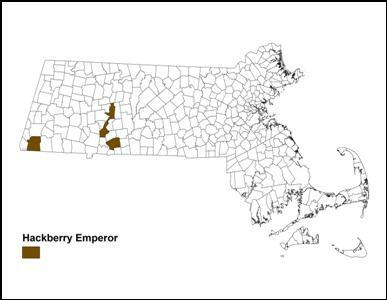 Did the Hackberry Emperor arrive in Massachusetts along with its host tree Celtis occidentalis? The continent-wide distribution of this butterfly closely follows that of its larval host plant, so it seems likely. The hackberry tree (C. occidentalis) prefers rich bottomland slopes frequently along rivers and streams (Cullina 2002: 81). It spread north into Massachusetts sometime after the last glaciation, the Connecticut River valley historically providing the main natural location. With urban and suburban development after 1860, hackberry began to be widely planted as an ornamental tree in parks and gardens, since it grows well in these locations and tolerates air pollution. Habitat for Hackberry and Tawny Emperors thus increased, but the butterflies have not expanded much beyond their lower Connecticut River and Housatonic River valley locations. The main host in Massachusetts is hackberry tree (C. occidentalis). Hackberry Emperors will also use Celtis tenuifolia dwarf hackberry and sugarberry C. laevigata. but these are rarely found in the northeast. C. occidentalis is native to and found in every county in Massachusetts except Barnstable (Cape Cod), Dukes (Martha’s Vineyard), and Nantucket (Sorrie and Somers 1999; Magee and Ahles 1999). Despite its bottomland preference, C. occidentalis also does well in dry upland, but inland, situations. Neither Hackberry nor Tawny Emperors are known to have adopted any new or non-native host plants, and thus they are not among the Switchers (Table 3). Hackberry Emperor is found along woodland trails, edges and roads, as well as old fields, where its host tree is present. It is also found in urban parks. The adult butterfly often perches upside down when landing on tree trunks, indicating its woodland habitat origins. Hackberry Emperor eggs are laid in clusters on the underside of the leaf, and larvae feed on fresh leaves singly or in small loose groups. Hackberry Emperors are bivoltine; the first flight being approximately in June, the second in August. A portion of the first brood of larvae, and all of the second brood, overwinter. Third-instar larvae roll or silk leaves together, and spend the winter inside these leaves on the ground near the base of the tree. In spring, the larvae must ascend the trunk and begin feeding again. They can most easily be found on the leaves of smaller saplings in spring (Allen 1997; Layberry 1998; Cech 2005). Like Tawny Emperors, adult Hackberry Emperors feed from soil, dung, carrion, rotting fruit and tree sap. They only rarely visit flowers for nectar. They will also land on humans and imbibe salts from perspiration. The 1986-90 Atlas had one report of Hackberry Emperor, from Forest Park Springfield on July 22, 1990, R. Pease. MBC records for this species begin in 1994, with Edna Dunbar’s 7/16/1994 report of one at Ashley Falls, Sheffield, reported on the Southern Berkshire NABA Count. MBC records 2000-2007 rank both Hackberry Emperor and Tawny Emperor as Uncommon to Rare, about on a par with Early Hairstreak, White M Hairstreak, and Hessel’s Hairstreak (Table 5). Hackberry Emperor is a bit less common than Tawny Emperor. Given the rarity of this species, Chart 61 should not be taken to indicate any abundance trend. A list-length analysis of MBC data 1992-2010 did not indicate any significant change in the detectibility of this species (Breed et al. 2012). The spike in reports in 1999 represents a good year for this species although there may have been some extra monitoring effort. That year set both early and late sighting dates (see below). The years 1998 and 1999 saw the highest raw totals of individual butterflies reported, 35 and 47 respectively. Numbers in 2010 - 2013 did not exceed 12 in any year. At the present time there are only three known locations for Hackberry Emperor in Massachusetts: Forest Park in Springfield; Holyoke Range State Park in Hadley/South Hadley/Granby/Amherst; and the town of Sheffield, mostly at Bartholomew's Cobble TTOR. The Springfield colony has been known since 1975 (see above), and has been visited frequently over the years. In MBC records 1994-2013, the high count there is 13 on 8/7/1999 by T. Gagnon et al. ; other more recent counts have been 9 on 8/17/2013, T.Gagnon et al. ; and 6 on 8/23/2009, T. Gagnon et al. Yearly counts are usually between two and eight individuals, and at least one has been reported every year 1995 – 2013, except for 1996. For a few years this location was reported as part of a Lower Pioneer Valley NABA Count. The Mt. Holyoke Hackberry Emperor colony was first reported in 1997 by Carl Kamp, when he was hiking the Metacomet-Monadnock trail. But Tawny Emperor turned out to be the more numerous Emperor there, and the high count for Hackberry Emperor at that site is only 2 on 8/29/1999, T. Gagnon. This is also the most recent report; there are no subsequent reports of Hackberry Emperor from this location, only of Tawny Emperor. In the town of Sheffield Hackberry Emperor was first reported from Ashley Falls in 1994 by Edna Dunbar. The butterfly has been seen at several locations within the town. From 1 to 2 individuals were consistently reported from Sheffield in July or August by Mark Lynch and Sheila Carroll (2003, 2005, 2007). The high count for this area is 3 reported on 8/4/2012, by M. Arey from Legeyt Road; there is also a confirming 7/30/2012 G. Kessler photo available on zenfolio. Single Sheffield sightings have been reported on the mid-July Southern Berkshire NABA Count in 1994, 1998, 2002, 2004, 2009 and 2012, however it was not found on this Count in 2010, 2011 or 2013. Obviously, this species has been rather scarce in the Sheffield area, more so than Tawny Emperor. AMATEUR COLLECTORS PLEASE NOTE; DUE TO THE RARITY OF THIS SPECIES IN THE STATE AND THE SMALL SIZE OF KNOWN COLONIES, PLEASE DO NOT TAKE SPECIMENS. Hackberry Emperor is thought to be bivoltine throughout most of its range (Opler and Krizek 1984), and Massachusetts appears to be no exception. According to MBC records, the flight period here extends from mid-June through mid-September (http://www.naba.org/chapters/nabambc/flight-dates-chart.asp). The first flight in June appears to be small (the highest number ever reported at Forest Park in June being six on 6/12/1999), while the second flight is larger (the highest number reported at Forest Park in late August being 13 on 8/7/1999). Earliest sightings: In the 20 years under review (1994-2013) the three earliest sightings in the records are 6/12/1999 Springfield Forest Park, T. Gagnon; 6/16/1999 Hadley Mt. Holyoke, D. Case; and 6/24/2001 Springfield Forest Park, T. Gagnon. In the years 2009 through 2013, there was no effort made to observe this species in its June flight, and so no June reports. Latest sightings: In the same 20 years (1994-2013) the five latest reports on record are 9/10/2000, 4 at Springfield Forest Park; 9/6/1998, 2 at Springfield Forest Park; 9/4/1999, 9 at Springfield Forest Park; 8/28/1999, 2 at Mt. Holyoke SP; and 8/25/2012, 6 at Springfield Forest Park. All reports are by T. Gagnon et al.. The 1986-90 MAS Atlas late date had been 8/20/1995, Forest Park, R. Pease. The 1990-95 Connecticut Butterfly Atlas reported approximately similar flight dates (but no September reports) in that state, with “apparently two generations” (O’Donnell et al. 1997). This butterfly may be slowly extending its range northward. 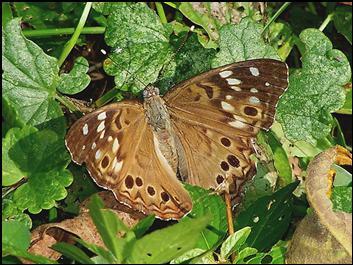 Several Hackberry Emperors were found and photographed in Rhode Island in 2008 (see photo 8-21-2008 by B. Martasian in Massachusetts Butterflies 31, Fall 2008; also H. Pavulaan masslep 9/5/2008), marking the first bona fide records for that state. The first Hackberry Emperor state record for Vermont was in 2002 in Burlington. While still rare, Hackberry Emperor has now been found June through September in Vermont, and two generations seem apparent (McFarlane and Zahendra 2010). This species, like the Tawny Emperor, is state-listed as a Species of Greatest Conservation Need in Vermont ( http://www.vtecostudies.org/VBS/sgcn.html). Hackberry Emperor remains rare in Massachusetts as well. It is not currently listed here as a Species of Conservation Concern, since it may be expected to increase here with climate warming (Table 6). However, existing known populations should be monitored and protected.